↑ Jeroen Temperman (2010). State-Religion Relationships and Human Rights Law: Towards a Right to Religiously Neutral Governance. BRILL. पप. 87–. ISBN 90-04-18148-2. 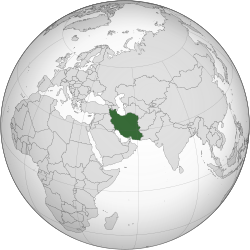 The official motto of Iran is Takbir ("God is the Greatest" or "God is Great"). Transliteration Allahu Akbar. As referred to in art. 18 of the constitution of Iran (1979). The de facto motto however is: "Independence, freedom, the Islamic Republic." ↑ Ethnologue. "Iran". Ethnologue. पहुँचतिथी 5 जुलाई 2015. ↑ 7.0 7.1 7.2 7.3 "Islamic Republic of Iran". International Monetary Fund. पहुँचतिथी 5 जुलाई 2015. ↑ "Human Development Report 2010" (PDF). United Nations. 2010. पहुँचतिथी 5 जुलाई 2015.